Located in North Carolina, M-B Industries with its divisions Sunbelt Stamping and Mitchell Bissell make OEM parts for a wide array of industries. 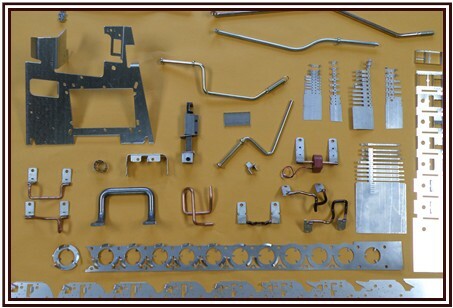 Our products include textile thread guides, tension guides, wire forms, headed wires, stampings, and assembled parts. In 1894 Mitchell-Bissell Company started operation in New Jersey as a supplier to the textile industry. By 1962, the textile industry had moved to the southeast and the company moved to its present location in the North Carolina mountains. The company expanded through the years to supply parts to the textile, watt hour metering, lawn and garden, automotive, health care, specialty parts,and power tool industries. Today we work closely with customers developing prototypes and manufacturing processes for new parts. In addition, we are adept at receiving existing tooling and optimizing it to improve part quality and performance. All these functions are done with a spirit of partnership and a desire to provide exceptional customer service. For customers in the southeast, M-B Industries has trucks for cost effective JIT delivery. Our customers are both large and small companies and include Itron, Elster Electrical, Husqvarna, John Deere and Welch-Allyn. M-B Industries welcomes you to its website and hopes that you will find it useful. Quality system designed to assure customer quality specifications are met or exceeded. In house trucking fleet to provide regional delivery solutions. Copyright 2019 M-B Industries, Inc.. All rights reserved.